Can you think of anything worse than trying on a bathing suit? Well I can. I have just been shopping to find the perfect pair of comfortable, figure flattering blue jeans. I think Levi Strauss and tailor Jacob Davis would be astounded to know that what they called “waist overalls” have become the most poplar apparel item in the world. It is estimated that Americans today own approximately seven pairs of jeans. And my how times have changed. The first pair of Levi’s 501 jeans sold for $1.46. Today with major fashion designers creating there unique version of this tried and true staple they can start at $100 and go up to well over $300 a pair. Not only can the price be confusing but there are the different styles to consider. There are flared, skinny cut, straight leg, boot cut, low rise and jeans with or without stretch built in. It is a true quest to find the right fit and with so many choices it is sometimes overwhelming. There is, however, hope. Many department and specialty stores offer assistance to those overwhelmed in their search. Bloomingdales, for example, offers outstanding customer service with well trained “denim specialists” to guide customers in finding the right fit and style for their body type www.bloomingdales.com. 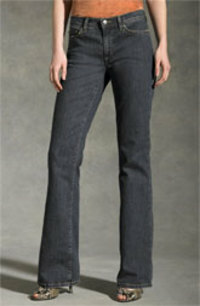 Nordstrom offers a comprehensive guide online to help you find the right pair of jeans www.nordstrom.com. Whether you are looking for the “must have” jeans for spring, which would be the skinny or peg leg jeans, or just want a new fresh pair there is help out there and a huge variety to choose from. Gather some friends whose option you can count on and head out to the mall for a day of shopping, lunch and good old fashion girl talk. Just remember to try the jeans on before you eat. I would love to know which styles you like the best. Keep me posted. Will you go with me to the Prom? We are once again entering that wonderful time of year when mothers and daughters joyfully go off together in search of the perfect PROM dress. Ok I am kidding about the “joyful” part. Most of the time it is probably a giant struggle between the two of how much to spend on the dress (and don’t forget the shoes, purse, hair and nail appointment) and the style and fit of the gown. In doing a little research of my own, I have a daughter who has already been through the experience and one who is approaching it, it seems that this years trend goes in two directions. You have large frilly dresses and sleek more sophisticated gowns. I found that it takes a certain girl to like the big dressy “ball gown”. Most of my daughters friends want something that is grown up yet not garish or sleezy. It varies from school to school as to the length. About half opt for floor length dresses and the other half would prefer just below the knee. Many of these shorter dresses can be worn again to other formal occasions. Halter or strapless dresses seem to be the style this year and the dress should be tighter on the top and more free flowing below the waist. When it comes to cost the general consensus seems to be between $175 and $300. With so many young people working part time these days the cost of the dress and possibly the evening are split between the parents and their teens. And I was pleasantly surprised to hear that most girls want their moms along for the shopping trip. I am glad to know that our option still means something. There are many good sites to look at online before you head out. www.Macys.com has a great selection as does www.shopzilla.com. You can’t buy online but www.DavidsBridal.com offers a great selection of trendy tea length dresses in pretty colors and is easy on the budget. Enjoy and have fun. Prom only comes around once! Hollywood’s glamorous leading lady Jennifer Aniston wore a beautiful black alligator LANA MARKS Cleopatra Clutch to the 2006 Oscars. A sleekly contoured evening bag, the Cleopatra Clutch is both elegant and fashion forward. Kate Winslet wore one in 2005 and Charlize Theron in 2004. Each Cleopatra Clutch is handmade and custom designed in Italy. Kates Clutch was dyed a unique shade of matte silver alligator and the frame was handcrafted in 18 karat white gold and paved with white diamonds and sapphires. The handbag had over 40 carats of diamonds and sapphires at a cost of $100,000. In 2004 Charlize chose a Clutch with over 1500 fully faceted and cut white and black diamonds set in 18 karat white gold also at a cost of $100,000. It took five skilled European artisans to complete the exquisite handbag. Lana J. Marks is CEO and Designer of her Palm Beach, Florida based companies. 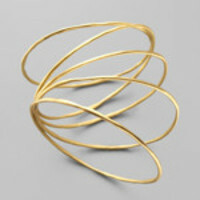 She has distinguished herself as one of the top accessories designers in both Hollywood and with royalty. She understands the need for proportion and versatility as well as glamour and sophistication. Her designs are available at her shops in Palm Beach, Rodeo Drive in Beverly Hills, as well as her shop on Madison Avenue in New York. They are also available in fine stores worldwide. You can visit Lana Marks at http://www.lanamarks.com. An eclectic array of glamous gowns graced the 500 foot long red carpet Sunday evening for the Academy awards ceremony in Los Angeles. Sophistocated bodices and draped overlays prevailed taking us back to the early days of Hollywood glamour. Versace, Vera Wang, Givenchy and Balenciaga were all represented on such stars as Salma Hayek, Jennifer Lopez, Keira Knightley, Hilary Swank and Nicole Kidman just to name a few. And gone are the days that such stars spend days shopping to find the perfact ensamble. It takes an army to get these A list girls ready for the big night. Not only do they spend days ahead of time pampering themselves with facials, massages and nail care for that perfact red carpet glow, they have their stylist doing the shopping for them. Designers, both clothing as well as accesories such as shoes and hand bags, clammer for the attention of just one star to show up in their design. "Once it shows up on the red carpet," said Lana Marks, a designer of high-end handbags, "you really can't keep it in stock." And there was plenty of "bling" walking the red carpet as well. Knightley wore an elaborate vintage Bulgari necklace and Dolly Partons Fred Leighton jewely cost a reported $1,200,000. It is a night of visual fantasy. Playing dress-up with all the beautiful pieces layed before them to choose from and when the party is over it all goes back and the stars go on with there normal lives. If you believe that I have a Vintage ball gown and diamond necklace you can borrow. Have you ever stood in or right outside your closet staring mindlessly at the array of clothing items, shoes, handbags and accessories wondering to yourself "what the heck am I going to wear today"?. Don't worry you are not alone. It is, without a doubt, a daunting task and one that might take place on more than one occasion in a single day. There is hope and you don't have to be Martha Stewart to take on the challenge. Start with what everyone should do at the beginning of each season. Go through your closet and try everything on. If it doesn't fit and never will get rid of it. If it doesn't fit but some alterations would make it one of your new favorite pieces take the time and money to have it altered. If you haven't worn it in over a year pitch it. If it is a vintage item or one that you could never part with find a safe place, package it well and label it for the future. Next, categorize your clothing into groups. Put all of your pants together, shirts together etc. Just because you bought a suit with the intent to wear it together doesn't mean that you can't separate it and pair it with something else to make more than one outfit. Within each group have some sense of color order. Too much time is wasted hunting around looking for the color you are trying to find. Simple, inexpensive shelves can be purchased at any home improvement store to house sweaters and t-shirts for easy viewing. The same concept can be applied to shoes and handbags as well. If you must keep your shoes in boxes label the outside with either a photograph or description for quick access. Hanging belts and necklaces on hooks will make coordination a breeze. Getting dressed everyday should not be your worst nightmare. Take the time to create a space that is user friendly and organized. After a couple of seasons it won't take you any time at all and it will make future purchases easier to make because you will know exactly what pieces you are lacking. The shows are over and the news is out. Popular Spring/Summer trends tend to be in bold prints, flowing skirts, shirt waste dresses, and wedge shoes. Add a long necklace or some bold beads and a large, bright handbag and you are ready to go. The soft romantic look is also a popular trend. Take an airy woven top with Victorian touches like lace, crochet, bell sleeves and ruffles and pair it with a sleek bottom: dark straight jeans or a pencil skirt. Spring fashions are always lighter and airier than fall and winter, but this season the fashion designers took the basics injected them with ruffles, bows and neutral colors. The look is a more refined, upscale look (and ultimately, more wearable). Shed your coats and gloves and get ready for Spring.